Lilligant in game: 204 Who? Important notice! 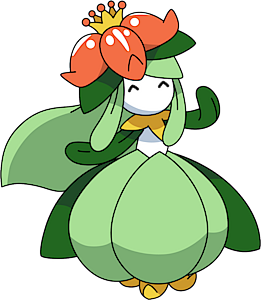 Pokemon Lilligant is a fictional character of humans. 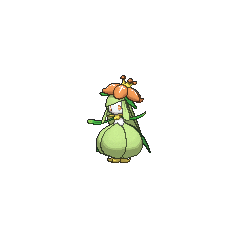 Lilligant (Japanese: ????? 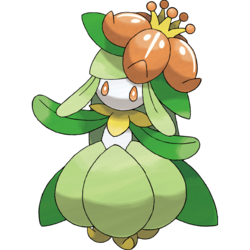 Dredear) is a Grass-type Pokémon introduced in Generation V.
The flower is on Lilligant's head is very difficult to coax into bloom. 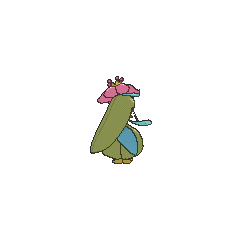 Once it does bloom, it will wilt if Lilligant is then neglected. The flower emits a sweet smelling aroma, and it is believed to have a relaxing effect on those exposed to the scent. It is a rare Pokémon that lives in forests. Lilligant is a female-only species of Pokémon with no male counterpart. A Lilligant owned by Lewis appeared in Stopping the Rage of Legends! Part 1 and Stopping the Rage of Legends! Part 2. Another Lilligant appeared in Beauties Battling for Pride and Prestige! under the ownership of Mona. She was often called "Lilligantette" by her trainer. 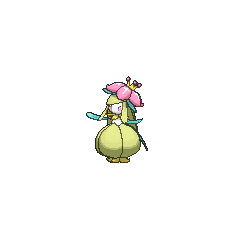 A Lilligant appeared in Master Class Choices!, under the ownership of Kazalie. It reappeared in Master Class is in Session!, where it was used in the Master Class Pokémon Showcase in Gloire City. Several Lilligant debuted in White—Victini and Zekrom and Black—Victini and Reshiram during the flashbacks telling the story of the Kingdom of the Vale. In addition, two more Lilligant appeared in the credits of Black—Victini and Reshiram, where they were frightened by a storm caused by Thundurus. 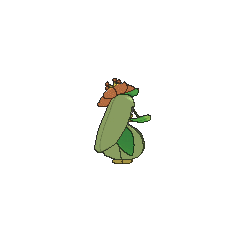 Lilligant has made cameo appearances in A Maractus Musical! and Climbing the Tower of Success!. A Lilligant appeared in a fantasy in Clash of the Connoisseurs! and All for the Love of Meloetta!. A Lilligant appeared in Party Dancecapades!, under the ownership of a Pokémon Performer participating in a dance party. A Lilligant appeared in a photo in SM008. A member of the Shadow Triad used a Lilligant to attack Lenora at Nacrene City. From its name and the curvature of its petals, Lilligant may be based on a lily, but the relaxing smell of Lilligant's flower is more akin to orange, pomelo, mandarin orange, or carnation flowers, all of which are used in essential oils for aromatherapy. With this, the leaves of its body may also be based on essential oil ingredients like spearmint and peppermint. Its crown and dress may be derived from Western high-class women's fashion during 1750–75. It could also be based on a dancer since its lower body resembles a ball gown and most of the moves it learns by leveling up contain the word "Dance". Mandarin Chinese ???? / ???? Qún'ér?xiaojie From ? qún, ? ér, and ?? xiaojie.